It's growing ever tougher to afford a home, particularly in Vancouver, Toronto and Victoria. But it's relatively easy to go bust, as some overextended Canadians may soon learn. That's the takeaway from a handful of recent studies, one of which warns a "day of reckoning" may be looming, at least for those who have borrowed far more than they should have. This comes amid exceptionally high property values in some cities, even as prices ease somewhat in regions such as the Toronto area, where recent provincial government measures are aimed at preventing a burst bubble. But it also comes amid rising interest rates, which is precisely the issue. The latest study of affordability by National Bank of Canada suggests we're now experiencing the "least affordable market" in nine years, based on mortgage payments as a percentage of income. This rose in the second quarter of the year, meaning that, nationally, it takes 39.4 months to save for a down payment on a "representative home" at a savings rate of 10 per cent. That's up from 35.3 months a year earlier. "The worsening of affordability in Q2 was the eighth in a row, the longest run in almost three decades," said Matthieu Arsenau and Kyle Dahms of National Bank. "As a result, our national composite is the least affordable since 2008," they added. "Canadian households have been able to fall back for some time on the condo market which was more affordable on an historical basis. However, the deterioration in Q2 was more acute in this segment compared to other dwellings. As a result, even the condo market is now the least affordable in years (worst since 2011)." Of course, that 39.4 months doesn't show the stark regional differences. While it takes just 25.5 months to build for a down payment in Quebec City, and slightly longer in Edmonton, it takes 127.5 months in Vancouver, 114.6 in Victoria and 105.6 in Toronto. In each case, these periods are far longer since than the average time frame since 2000. For years now, Canadians have been warned about their record debt levels, by the Bank of Canada, groups such as the International Monetary Fund, credit rating agencies and others. The latest comes from BCA Research, whose recent study, released after the Bank of Canada's mid-July rate hike, warns that "a credit-driven downturn in spending is a highly probable event for the Canadian economy over the long run, rather than a risk." Jonathan LaBerge, BCA's vice-president, special reports, looked at past evidence and other countries to come to the conclusion that Canada's economy is improving, which "in isolation" supports a gradual increase in interest rates, but that it "will all likely end in tears." "While we agree that the Bank of Canada is on a path to gradually raise interest rates over the coming year and that the economy is currently in good shape, the odds are good that tighter policy (and/or other factors) will eventually inflict considerable damage to the Canadian economy via the housing market and its impact on highly leveraged consumers," Mr. LaBerge said. "In this regard, the pickup in Canadian economic growth likely represents a happy moment in an otherwise sad story." Mr. LaBerge said it won't happen immediately – as in, not in the next six months to a year – but rather when we see the "reversal" of three things that prompted the binge borrowing in the first place. The first, of course, is cheap money. That's already starting to change, with the Bank of Canada's mid-July hike of one-quarter of a percentage point in its benchmark overnight rate, to 0.75 per cent. Observers believe near-term increases are in the pipeline, though the extent and time frame are unknowns. A total jump of 1.5 percentage points over two years would drive up the debt service ratio, or what it takes to handle your debts, markedly, though that's not expected until at least mid-2019. Factor No. 2 is government spending, which should buoy households through next year. "But beginning in 2019, fiscal policy is forecast to become a persistent drag on growth, and it is even possible that the sharp deceleration in fiscal thrust set to occur next year could act as the proximate cause of serious problems in the Canadian housing market," Mr. LaBerge said. The final factor would be a "shock" to the inflow of foreign money, be it driven by Canadian or outside forces. The B.C. tax on foreign buyers of Vancouver area properties, for example, slowed the city's housing market but didn't crash it. Ontario measures aimed at cooling Toronto are expected to have a similar impact. "Cyclically, we would become more concerned were we to observe a combination of additional restrictions on foreign capital inflow, higher minimum down payment thresholds for houses priced at or below median levels, and a significantly lower allowable gross/total debt service ratio," Mr. LaBerge said. Anything outside Canada's borders that would affect the flow of capital could also have an impact, he added. Benjamin Tal, for one, doesn't believe a simple increase in interest rates will spark a wave of loan defaults, but that assumes there's no recession looming. "Too severe rate-induced slowing in consumer spending and real estate activity could be recessionary, and eventually turn the growth story into a credit quality story," said Mr. Tal, deputy chief economist at CIBC World Markets. "The Bank of Canada is not oblivious to this fact, and even acknowledged, when it hiked recently, that consumers are more sensitive to interest rates in this cycle," he added in a report. "Our working assumption, therefore, is that the disease is also the cure, and that the increased sensitivity to higher rates will prevent the bank from moving too rapidly." A recession, of course, changes the dynamic, and some observers believe the U.S. could be facing one within a couple of years. 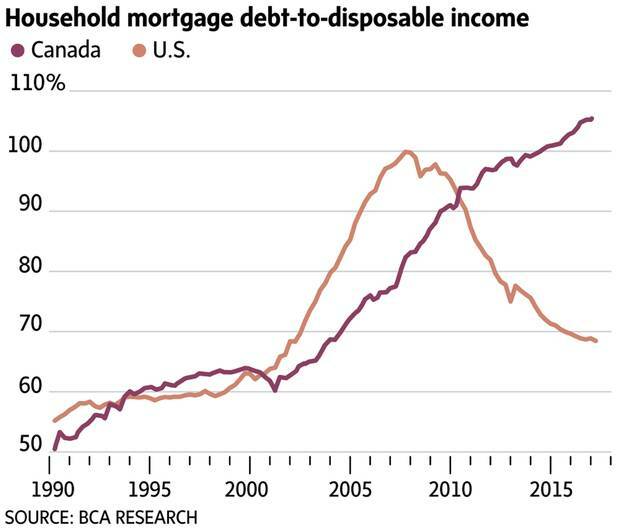 "Clearly there are additional macro factors that could trigger the onset of a major debt payback period in Canada, and chief among these would be the next U.S. or global recession," said BCA's Mr. LaBerge. "For example, we recently noted how continued tightening from the [Federal Reserve] could set the stage for a U.S. recession in 2019, which could easily trigger either a prolonged period of stagnant Canadian growth or an active deleveraging event."